Rippleffect and the Center for Grieving Children offer a camp experience free of charge to a dozen refugee children. 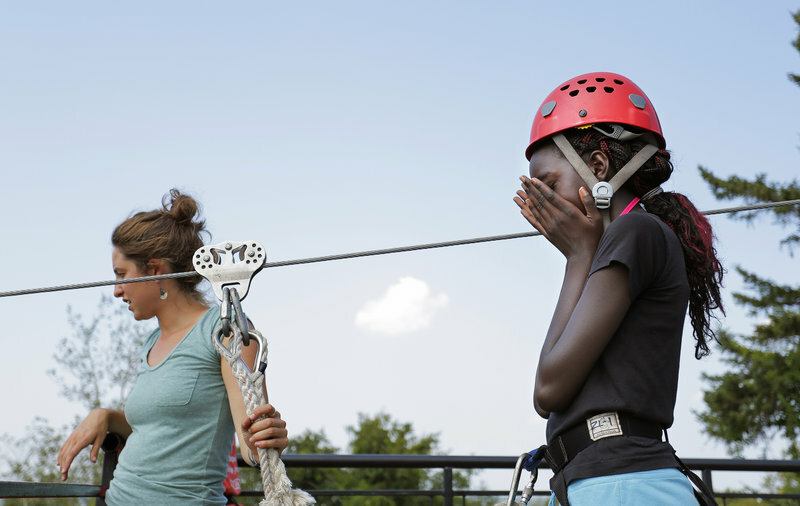 She may not remember it, but Nyamouch Gai’s first camp experience a decade ago was far different from the ropes course, zip line and kayaking trips she has enjoyed for the last four days on an island in Casco Bay. “Before we came here, we were in a refugee camp,” said Gai, 14. Salar Salim, 12, of Portland, originally from Iraq, gets some help from Ayla Zeimer getting his helmet on right for the zip line. 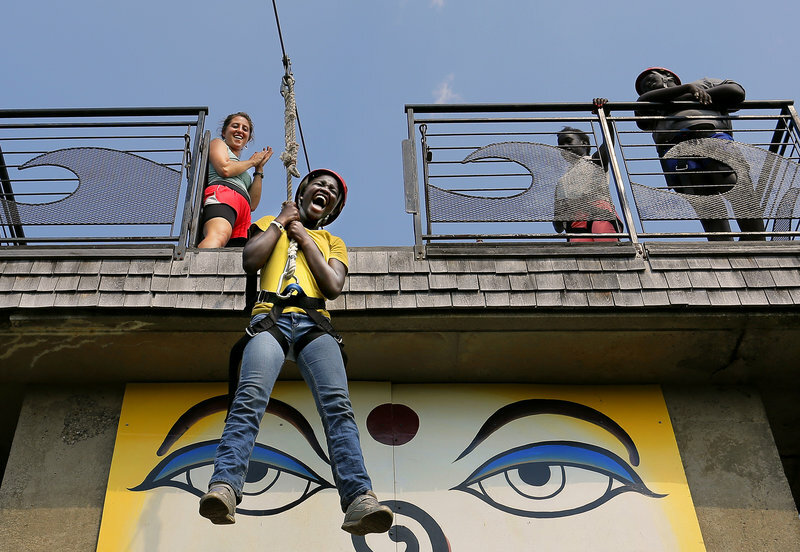 Doki Yanga, 12, of Portland deals with her nervousness Thursday as she prepares to ride the zip line on Cow Island during a five-day confidence-building experience. She is originally from South Sudan, and is one of a dozen Portland children with similar life stories who participated in a five-day confidence-building experience sponsored by the Center for Grieving Children. For Gai, it was not only a team-building exercise, but a chance to push herself to accept new experiences, a challenge that began on the brief boat ride over to Cow Island. By week’s end, Gai was kayaking and learning about Maine’s coast, said Anna Marie Klein-Christie, executive director of Rippleffect, the organization that owns the island less than two miles from Portland. Three years ago, Rippleffect and the Center for Grieving Children joined together to explore how to improve on the weekly sessions during the school year that the center sponsors for refugee children. 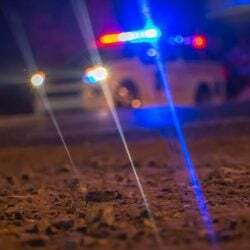 The organizations wanted to help them cope with their experiences and make positive connections in the community. Supported this year by a $25,000 grant from Walmart, the camp is offered free of charge to the 12 students who signed up. Along with South Sudan, the campers are originally from Iraq, Cuba, Haiti, Colombia, Burundi, Rwanda, Uganda, Cambodia and Vietnam. Although Gai does not remember her family members’ involvement in war, she has already noticed the lifelong effects. Gai said that since she has participated in the center’s sessions, she has learned how to open up to her peers and make more friends.